To save on effluent disposal costs and recover good product, food wash waters and effluent liquids from food production lines can be screened using fine-mesh vibratory screeners. The high-speed Finex 22™ Sieve is a versatile unit suited for screening difficult powders as well as high viscosity liquids. This high-performance industrial screener is used to reclaim wash water used during the cleaning process of various herbs. Before the herbs are packed and shipped they need to be rinsed to remove contamination. After this process the wash water needs to be screened to remove any remaining herbs which are left in the water. The Finex 22™ Sieve successfully removes all contamination ensuring the water can be reused in the process. 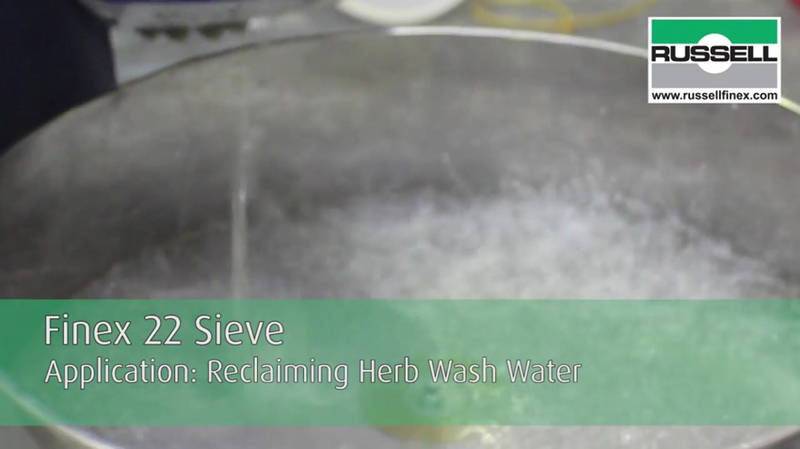 In a Russell Finex test laboratory video, the Finex 22™ Sieve is shown cleaning and recovering herb wash water. The Finex 22™ Sieve is the most versatile powerful vibrating screener on the market. With a very small footprint and being fully portable, the unit can be used at multiple locations in your production line to recover good product from wash waters or clean effluent liquids for disposal. Benefitting from easy disassembly, mesh screens can be changed quickly, ensuring downtime is reduced and production costs are lowered. A range of other liquid solid separation equipment and self-cleaning liquid filters is available for processing industrial was waters. All Russell Finex separation equipment can be tested at one of five state-of-the-art testing facilities. This allows customers to be sure that the equipment which is chosen best suits their application.